Improving access to justice for the problems which face many people day-to-day deserves focus and action. As such, Community Legal Centres NSW wholeheartedly supports the intention to provide more efficient and cheaper methods and resolutions for civil justice disputes within NSW. 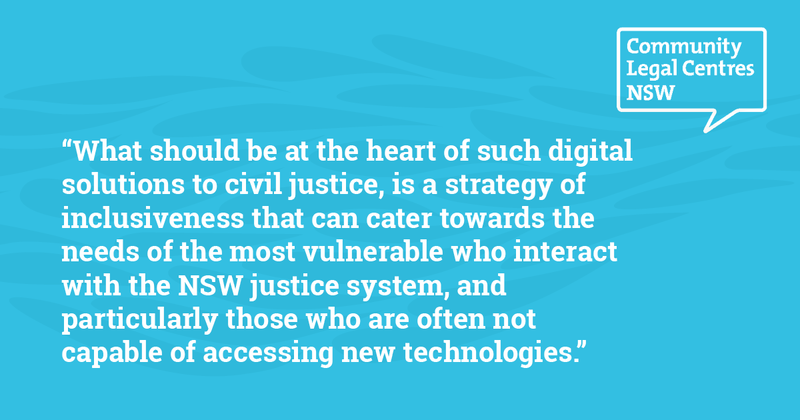 What should be at the heart of such digital solutions to civil justice, is a strategy of inclusiveness that can cater towards the needs of the most vulnerable who interact with the NSW justice system, and particularly those who are often not capable of accessing new technologies. Subsequently, Community Legal Centres NSW has identified three aspects in which this can be achieved. First, that any modernised civil justice system, and the processes and technologies on which it relies, should be designed with the intention of being accessible to all those within our communities. Second, that once these new processes and technologies are in place, that there is assistance given directly towards those most vulnerable and disadvantaged within our communities to use and benefit from new online and digital tools. Third, that in the process of ensuring accessibility, it is recognised that there will always be those disadvantaged people who require intensive and comprehensive legal advice and assistance. To provide this accessibility, community legal centres across NSW need increased funding so that they have the resources and staffing to better facilitate access to justice for the vulnerable. To go about achieving these three main goals, seven recommendations were developed (see below). You can access our full submission here. Simple, easy-to-use pre-decision checklists can be promoted directly to members of the public through online channels. They could be used by community legal centres and other legal assistance providers in community legal education workshops, in order to skill up non-legal workers and disadvantaged communities so they are aware of them and know how to use them. The Department of Justice is encouraged to collaborate with community legal centres in the design, testing and rollout of online information and other digital systems, processes and digital strategies, recognising our expertise in both civil law and working with vulnerable clients. Community legal centres that are accredited through the Community Legal Centre National Accreditation Scheme are also recognised under any NSW Quality Mark or other quality system for legal information or advice services. The NSW Government takes a ‘universal design’ approach to the design of new technologies. The NSW Government ensures ‘flags’ for referral to legal services are integrated into the design of digital tools, systems and services. The NSW Government facilitates the use of digital tools by vulnerable and disadvantaged people through the provision of additional funding to community legal centres for a ‘Digital Access Pathfinder Service’. The NSW Government provides additional funding for the core work of NSW community legal centres so that we can better provide assistance to vulnerable and disadvantaged clients, who need more intensive assistance than can be provided by online self-help tools.